Bali Eka Jaya has become one of the most reliable and most frequently used companies in Bali, offering cheap crossings at very reasonable prices. The Eka Jaya Fast Boat possesses an engine with 1500HP, demonstrating the raw power it uses to transport passengers across the deep blue waters. Up to 180 individual seats ensure a comfortable and safe sailing, ranging from cosy seating areas on the lower deck to the spacious outdoor areas that afford incredible views of the stunning surroundings. Passenger care is of paramount importance to the hardworking and friendly staff on board each vessel, showcased by the set of safety equipment stocked on the boat. Travelling between such popular tourist locations, especially Bali and the Gili Islands, Bali Eka Jaya provides an enjoyable and comfortable crossing around the most prominent areas of Indonesia. A fully functioning toilet, fire alarm and fire extinguisher are available at all times, adding an extra sense of security on the vessel. After landing at the harbour in Padang Bai, the Gili Islands, Serangan or Lembongan island, the company offers a free transfer to your resort, typically travelling in a minibus to the most popular hotels. 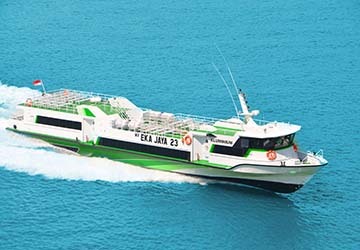 View Bali Eka Jaya timetables, prices and book Bali Eka Jaya ferry tickets with directferries.com. Looking for an alternative route or ferry company to fit your plans? Don’t worry, we’ll also compare Bali Eka Jaya with alternative ferry companies in your search to help you choose.